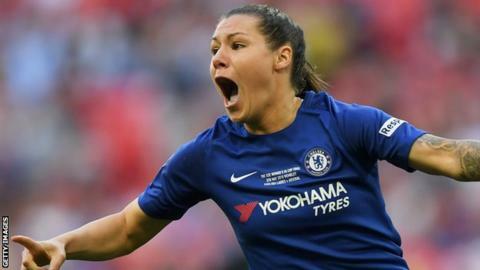 Chelsea recorded back-to-back Women's Super League wins for the first time this season as Ramona Bachmann's second-half brace downed West Ham. Bachmann tucked home the rebound after her initial shot hit the post as heavy Chelsea pressure was finally rewarded. The Swiss striker sealed the win late on, curling home from about 15 yards. United keeper Becky Spencer had earlier kept Chelsea at bay, denying Fran Kirby one-on-one and making fingertip stops from Hannah Blundell and Beth England. Chelsea, who reached the Champions League quarter-finals in midweek, remain in fourth place, level on points with Birmingham but with an inferior goal difference. Match ends, West Ham United Women FC 0, Chelsea FC Women 2. Second Half ends, West Ham United Women FC 0, Chelsea FC Women 2. Ramona Bachmann (Chelsea FC Women) wins a free kick on the left wing. Foul by Esmee de Graaf (West Ham United Women FC). Attempt missed. Hannah Blundell (Chelsea FC Women) right footed shot from outside the box misses to the left. Substitution, Chelsea FC Women. Deanna Cooper replaces Drew Spence. Attempt missed. Julia Simic (West Ham United Women FC) right footed shot from outside the box is just a bit too high from a direct free kick. Julia Simic (West Ham United Women FC) wins a free kick in the attacking half. Goal! West Ham United Women FC 0, Chelsea FC Women 2. Ramona Bachmann (Chelsea FC Women) right footed shot from the left side of the box to the top right corner. Assisted by Hannah Blundell. Offside, Chelsea FC Women. Jonna Andersson tries a through ball, but Ali Riley is caught offside. Jonna Andersson (Chelsea FC Women) is shown the yellow card for a bad foul. Foul by Jonna Andersson (Chelsea FC Women). Substitution, Chelsea FC Women. Jessica Carter replaces Francesca Kirby. Offside, West Ham United Women FC. Rebecca Spencer tries a through ball, but Leanne Kiernan is caught offside. Erin Cuthbert (Chelsea FC Women) wins a free kick in the attacking half. Foul by Brianna Visalli (West Ham United Women FC). Attempt missed. Alisha Lehmann (West Ham United Women FC) right footed shot from outside the box misses to the left. Assisted by Esmee de Graaf. Delay in match Rebecca Spencer (West Ham United Women FC) because of an injury. Francesca Kirby (Chelsea FC Women) wins a free kick on the right wing. Foul by Kate Longhurst (West Ham United Women FC). Goal! West Ham United Women FC 0, Chelsea FC Women 1. Ramona Bachmann (Chelsea FC Women) left footed shot from very close range to the bottom right corner. Ramona Bachmann (Chelsea FC Women) hits the left post with a left footed shot from the centre of the box. Attempt blocked. Francesca Kirby (Chelsea FC Women) right footed shot from outside the box is blocked. Assisted by Erin Cuthbert. Substitution, Chelsea FC Women. Ali Riley replaces Beth England. Corner, West Ham United Women FC. Conceded by Hannah Blundell. Attempt blocked. Leanne Kiernan (West Ham United Women FC) left footed shot from the centre of the box is blocked. Assisted by Jane Ross. Attempt blocked. Jane Ross (West Ham United Women FC) left footed shot from outside the box is blocked. Attempt blocked. Sophie Ingle (Chelsea FC Women) left footed shot from outside the box is blocked. Offside, Chelsea FC Women. Sophie Ingle tries a through ball, but Francesca Kirby is caught offside. Attempt missed. Erin Cuthbert (Chelsea FC Women) right footed shot from outside the box is too high. Assisted by Sophie Ingle. Sophie Ingle (Chelsea FC Women) wins a free kick in the attacking half. Esmee de Graaf (West Ham United Women FC) is shown the yellow card for a bad foul.